All summer long there have been a variety of reports repeatedly saying thinks like "Indications are Kevin Garnett will return to the Nets." But not once in two and a half months has the 38-year-old actually come out and said that he plans to return to the NBA for a 20th season. 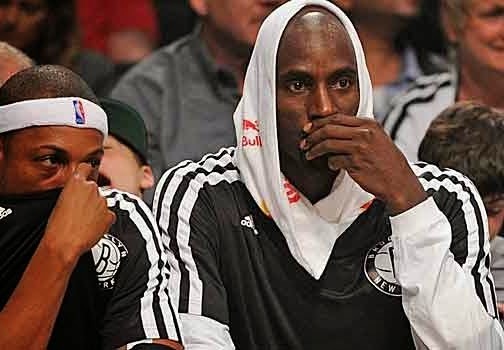 With Paul Pierce gone and Brooklyn not looking like a contender, what does Garnett have left to play for? 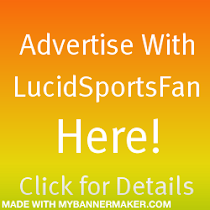 Check out my article on this subject Brooklyn Nets: Is Kevin Garnett Definitely Returning? It's my first for SirCharlesInCharge.com, an NBA site that is part of the FanSided network, an affiliate of Sports Illustrated. Back in spring training I suggested the possibility of Daniel Nava making the All-Star Game (last season he hit .303 with a .385 on-base percentage). He then responded by batting a horrific .149 in the month of April, which led to a demotion to Triple-A. 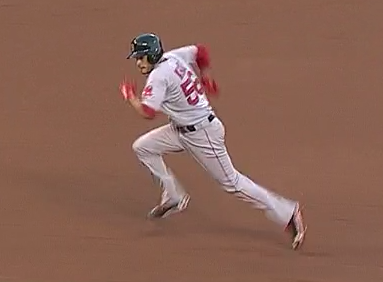 However, since Nava's return to Boston on May 24 he's been very close to the same player he was a year ago. In his last 56 games Nava is hitting .295 with a .366 OBP. In the early part of the season I was convinced that the Red Sox's struggles were due to their inability to win close games. On June 16 they were 31-38, but just 5-12 in one-run decisions. 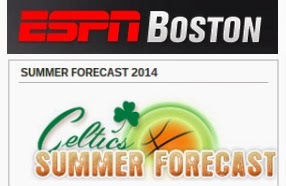 Since then Boston is 19-11 in one-runs games, and now 24-23 in those contests for the season. Clearly that wasn't the issue, as the Sox are still in the AL East basement at 54-65. A long long time ago in the very beginning of my athletic career I was once a left-handed pitcher myself. In various sports at different ages I had a number of coaches who referred to me as "Lefty." 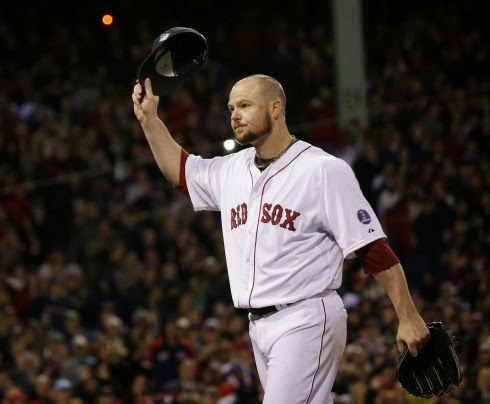 So being that Lester was a homegrown left-handed star pitcher in the Red Sox organization, he held a special place in my heart from the very beginning. Then he went out and beat cancer in 2007 on his way to helping the Sox win the World Series. After that Lester just so happened to pitch a no hitter in 2008, and on a night that I was in attendance at Fenway Park no less. And let's not forget his instrumental role in a second World Series championship last year. "In the greater scheme of things, we're talking about just a stupid amount of money. For me, I want to be comfortable. The way I look at it is, if someone gives you $170 million and someone gives you $150 million, is that $20 million really going to change your lifestyle? Same thing if the highest bidder is $100 million and the team you're going to feel most comfortable with offers $80 million. Is that $20 million really going to make the difference in your lifestyle?" This is basically word-for-word an argument that I have made time and time again while discussing pro athletes. I'm always shocked when the small difference in an already exorbitant amount of money is their deciding factor when choosing where to play (over any number of other variables like team, location, opportunity to win, competitive nature, chance to make history, etc.). Jon Lester says that will not be the case for him. Whether or not this brings him back to Boston, I'll be extremely proud if the soon-to-be free agent's actions stay true to his words. Have we ever seen anything like the ALS Ice Bucket Challenge? Over the weekend the only thing that appeared in my facebook feed was person after person dumping buckets of ice on their heads. This thing is amazing. 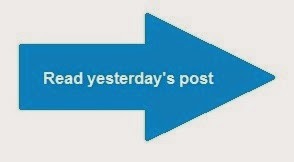 Since the dawn of facebook and twitter there's been nothing else like it. I'm trying to think of what to compare it to from the dark days of pre-smartphone technology (if you have any thoughts on this, please share them); a grassroots born cause that the entire country is eagerly participating in. By the time the ALS Ice Bucket Challenge got around to me it had already saturated social media. I felt like nobody would be interested in seeing yet another person spilling a bucket of ice over themselves. I decided to go with a different approach, and I challenge all the other people who've been nominated and haven't done it to go online and donate at alsa.org. Plus, I hate freezing cold water. 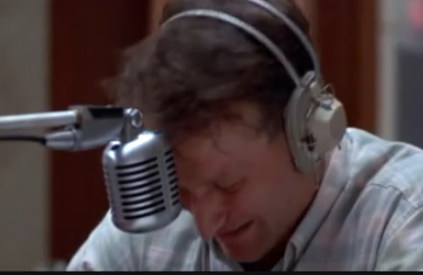 Awesome Old Movie Clip of the Week: Robin Williams reads unofficial news in "Good Morning Vietnam"
I had an awesome old song all set and ready to go for today, but then the shocking Robin Williams suicide news broke. I'll keep the song on file for next week. And I can't believe it's been 17 years since Good Will Hunting came out. 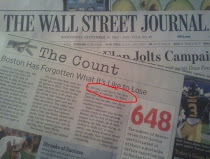 Also from 1997, Remember when Williams was on Friends? Didn't Ray Allen sacrifice his rights to vacation on Martha's Vineyard when he joined the Heat? One of the first things Barack Obama did on his Martha's Vineyard trip was to play golf with Ray Allen and Amhad Rashad. A), good for the President. If I was him and I heard those two were on the island I'd absolutely want to go golfing with them as well. But B), in my mind Ray Allen shouldn't really have even been there in the first place. I know Ray and his family have been vacationing on the Vineyard for a long time. 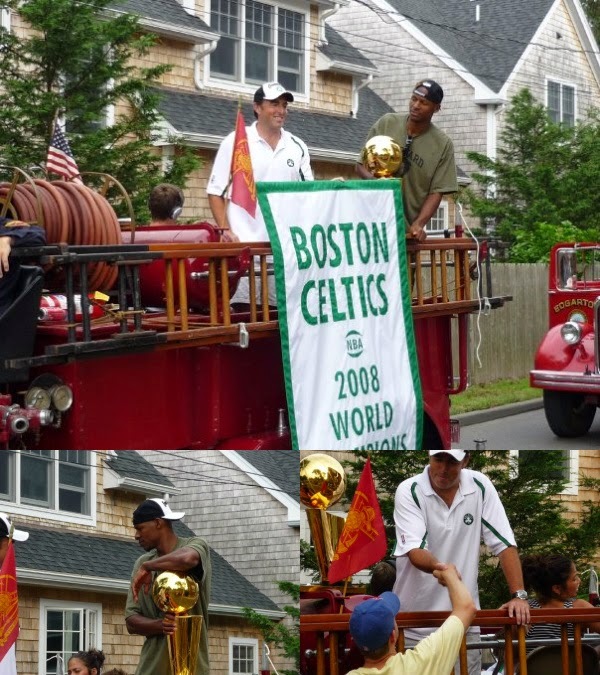 I'll never forget when he and team owner Wyc Grousbeck carried the Celtics' championship trophy in the Edgartown 4th of July parade back in 2008. That's me shaking Wyc's hand. From my own experience and multiple other Vineyard sources, Ray has always been extremely nice and friendly to everyone in his time there. But Bostonians take their sports pretty seriously, and regardless of who Ray is in real life, after the way he spurned the Celtics for Miami in July of 2012 it probably would have been wise for him to find a new vacation spot outside of Massachusetts.